I say Tomotto…you say Tomaaato! Anyway you slice it, the delicious lush tomato is one of natures power fruits! 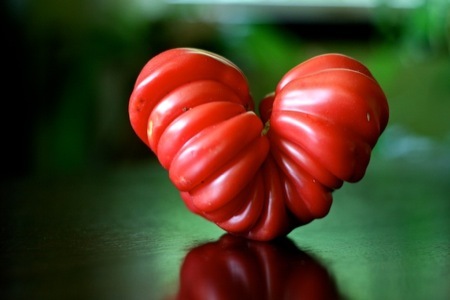 Below are some fab reasons to indulge in the scrumptious juicy world of a tomato! 1. Packed with health benefits, tomatoes contain tons of Calcium which are wonderful to build and maintain strong bones. 2. Our skin is our largest organ. Tomatoes contain very high levels of lycophene. That is a substance used in some of the more expensive face creams. For a beautiful facial, slice and peel about 8 tomatoes. Then place the skin of the tomatoes on your face for about 10 to 12 minutes. Finish by washing your face with lots of water. Your face will be pretty and shiny. 4. Although it won’t aid in helping you to quit smoking, tomatoes coumaric acid and chlorogenic acid that work to protect the body from carcinogens that are produced from cigarette smoke. Which in turn reduce the damage caused by smoking. So, put that in your pipe and smoke it! 5. 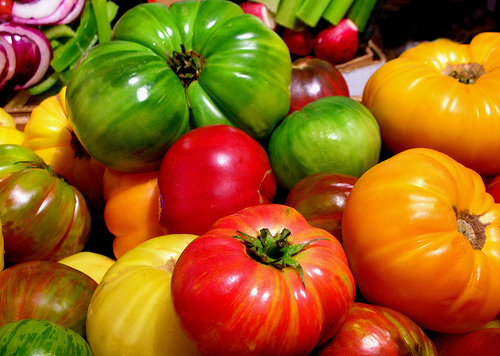 Tomatoes can lower blood pressure and reduce cholesterol because they contain Vitamin B and potassium. This is great news!! I don’t know about you, but the only heart attack that I want to experience is by being smothered in love filled kisses from my God children, Annabella Joy and Lily Love. 6. Cell damage is caused by free radicals and antioxidants work like superman coming in to save the day. Tomatoes contain both Vitamin A, in addition to vitamin C. Note that Vitamin C is destroyed by cooking so in this regard, feel free to grab a bit of salt and bite in! 7. Jeepers Creepers, where cha get those peepers…where cha get those eyes!!! Yeap, you guessed it! The Vitamin A in tomatoes not only makes your beautiful peepers bright, but can also prevent night blindness. 8. Tomatoes are packed full of the valuable mineral known as chromium keeping blood sugar levels under control. People that suffer with diabetes would find it very beneficial to indulge in a yummy cucumber/ Tomato salad. Not only would that be an excellent meal for your blood, but your teeth would be smiling happy due to, once again, the wonder of vitamin A. 9. Saving the best for last! Being an organic Hairstylist for many years keeps me on my toes in terms of knowing what keeps the hair strong and beautiful. Vitamin A, which I fondly refer to as Vitamin “YAY” is an awesome source for maintaining the hair’s luxurious beauty and shine. 10. Okay, one more… Start em early. Kids, love love love projects. Why not go up to your local nursery and buy a little starting pot and tomato seeds, plant them with your kids and watch them grow. There is just something about growing your own food that makes it taste so much better. 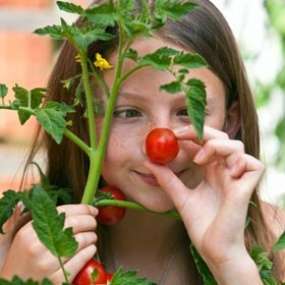 Kids can learn all the benefits of Tomatoes while they are growing. It will deter them from being tempted to eat poisoned processed ,ummm, I guess we can call it food? by growing their own real live food it gives them a sense of confidence and accomplishment. And well, you know the rest. The tomato is my favorite veggie (or is it a fruit)..so versatile.. Yes, A tomato is technically a fruit. 🙂 thanks for following ! !